It's time for another Decor Steals giveaway! I love when their daily emails pop in my inbox every morning at 10 ET and I click on to see what steals are being offered. I love signs and especially ones that look old and come at a super price like this one I purchased from them recently. It is perfect in the sun room. I purchased this cow head a couple years ago and hung it on my hood above my cook top. Recently I switched things up, imagine that, and moved it to this nook over the chest. I purchased the boxwood wreath a couple months ago and have it hanging on this old bread board in the kitchen. 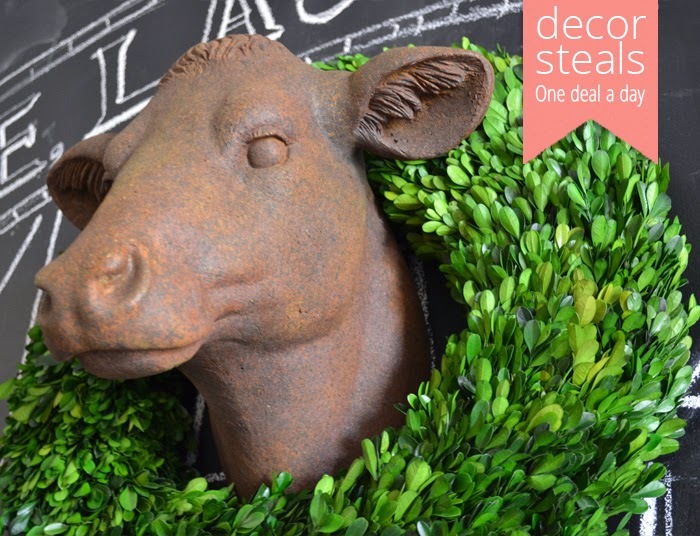 The cow head and boxwood wreaths are best sellers and are requested to be brought back frequently. Your request will be available in the next couple weeks. The cow head and a boxwood wreath that will easily fit over the cow head will be available so watch out for those. Today's steal are these cute farm baskets and you can use these in so many ways. Just be creative. Here are a few more future steals. This standing basket could be used in the laundry room, playroom holding toys, towels in a bathroom, in an office holding bolts of fabric for a decorator or large rolls of paper like house plans for a builder, etc. I've seen a lot of folks use this tatoo bamboo rug. 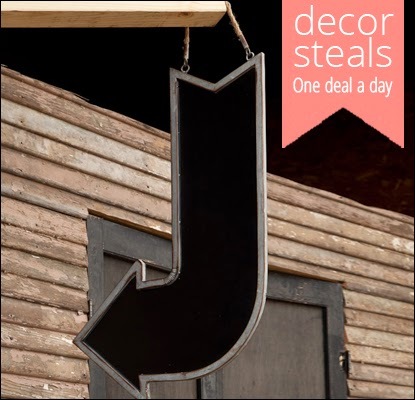 Entry One: Check today's deal at decorsteals.com and extended steals and tell them which deal strikes you the most (PS you can also vote for a future steal by liking any of the deals in the Pick Steal section.) Pretty cool, right? I liked them on Google+ also. I swear.... you turn me on to the most FABU websites. I feel like I've been living under a rock. I love the black suitcase! Great Giveaway Kim...I love the burlap buckets! I love the fabric that they offer...who doesn't love grain sack? I liked them on Google+. Today's great steal is already sold out...I love the two tiered wired tray.....Great giveaway! I have ordered from Décor Steals several times and love their "steals"! I already subscribe to their newsletter/email. I have subscribed to Décor Steal's newsletter for about a year. I love the enamelware tray but it's sold out. I also like the vintage style suitcase! I follow them on Google+! I am definitely going to sign up! I love every "steal" you showed! I did them all. Loved the enamel tray but it was sold out. Maybe that was yesterday's deal. I am going to break the bank with this site. I love the enamel ware tray. I'm following them on Google+ also. I love Decor Steals! I would go of the vintage suitcase if I had to pick a steal that's available right now but what I really want is that chalkboard arrow - love! I follow Decor Steals on FB! I follow Decor Steals on Google+! I subscribe to Decor Steals' newsletter! I subscribe to the email and am like a kid in the candy store waiting for it to show up in my email at 10:00am. I subscribe and follow them on the sites mentioned. Eeek...hope I win! i like that luggage with the drawer-it's a great way to actually be able to use that piece. thanks. and i like them on fb. have a great day. Love Decor Steals and I subscribe to their daily evil emails!!! I buy what I love - and I love it all darn it!!! I am their fan on Facebook!!! I subscribed, I am also a FB fan. Love that cupcake stand. I subscribe to their daily email! I also like the vintage suitcase! I would love to WIN a Decor steals gift card! Thanks for the opportunity! That standing basket is so adorable. I can think of umpteen places to use it! 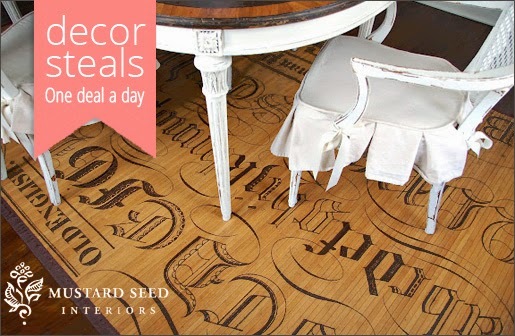 I checked out today's deal and commented at Decorsteals.com! I subscribe to Decorsteals email newletter! I like Decorsteals on Facebook! I have followed Decorsteals on Google +! My email address is dixiedeana@gmail.com. Thanks! I'll try but I never win anything! :) I love that boxwood wreath! The chalkboard arrow sign is adorable too. 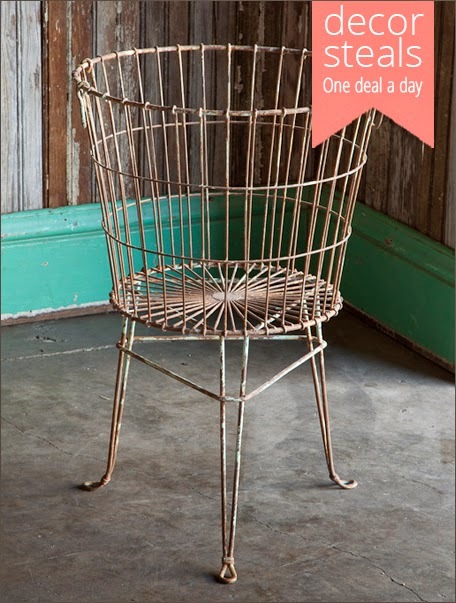 What a great giveaway-- I love those wire farmhouse baskets! The burlap buckets are super cute as well. Love Decor Steals. I love the chalkboard arrow and the laundry basket. Thanks for the chance. I am an email subscriber. Thanks for all the chances. I like them on facebook as well.. Lovely giveaway! I like them on google +! Hi Kim - great giveaway! I love the vintage salt and pepper shakers on the extended listing. I am already a follower of their site. I liked them on Goggle +. I liked them on Google. I already subscribe to their e-mails and have bought things. I like the galvanized metal tray. I follow them on Facebook and get their emails. I love the 2 set baskets!! I like their fruit jar salt and pepper shakers. I love Décor Steals and I can't wait until 10 a.m. either for their steal. I purchased that cow head for our new kitchen months ago and many other items for the new house. I love that standing basket. I follow them on FB and I obviously get their emails. Thanks for the chance to win, fingers crossed. I subscribe to Decor Steals newsletter and just like you Kim I love opening that email to see what the steal of the day is! I like Decor Steals on Facebook and there's always lots of ideas for different uses for the steals. 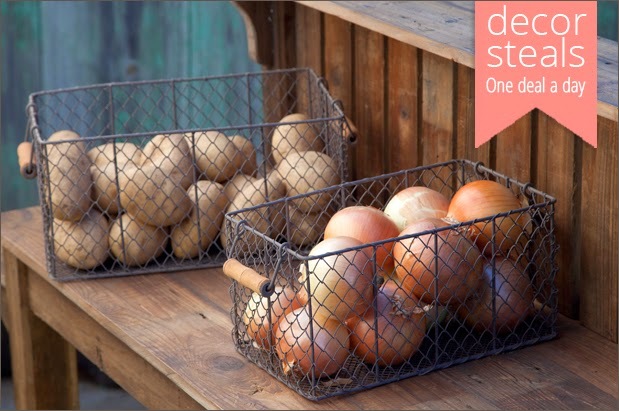 I love the VINTAGE FARMHOUSE | RECTANGULAR WIRE BIN BASKETS, SET OF 2! I am an email subscriber of theirs. I love the wire bin baskets, lots of uses for those! I like Decor Steals on Google+, half of the things in my house are from Decor Steals, well maybe not half but ALMOST. I happily receive their emails daily! 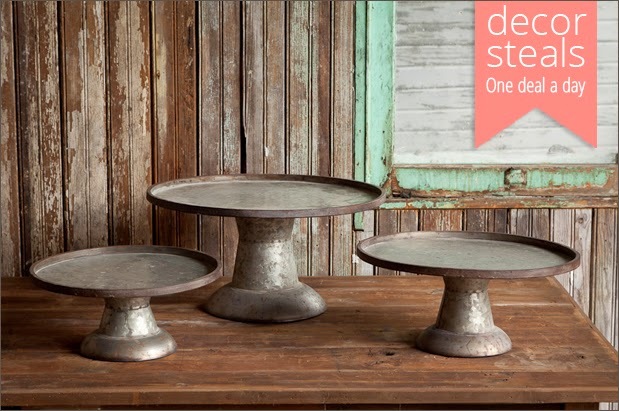 I'm hoping they offer the galvanized cake stands again soon! Love those! I had previously liked them on FB. I already get there email! I love the standing basket and have the perfect spot in my laundry room. A great idea! My favorite item is today's special, the Metal Hydrangea Pillar Holder.